The Education Fellows program provides an integrated academic and experiential opportunity for students who demonstrate exemplary potential and a desire to impact the education profession. 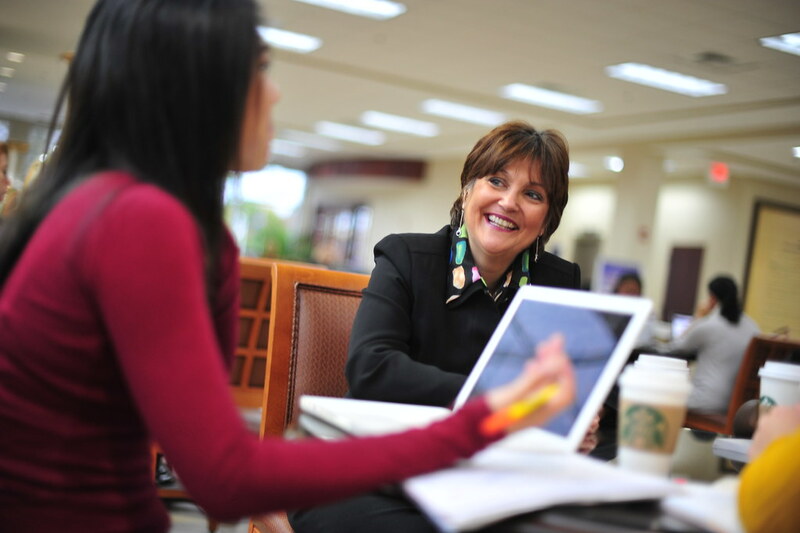 The four-year experience focuses on the themes of connection, engagement, challenge and leadership. It supports fellows as they work together in common courses to co-design innovative solutions to educational challenges that are manifested in schools and communities. 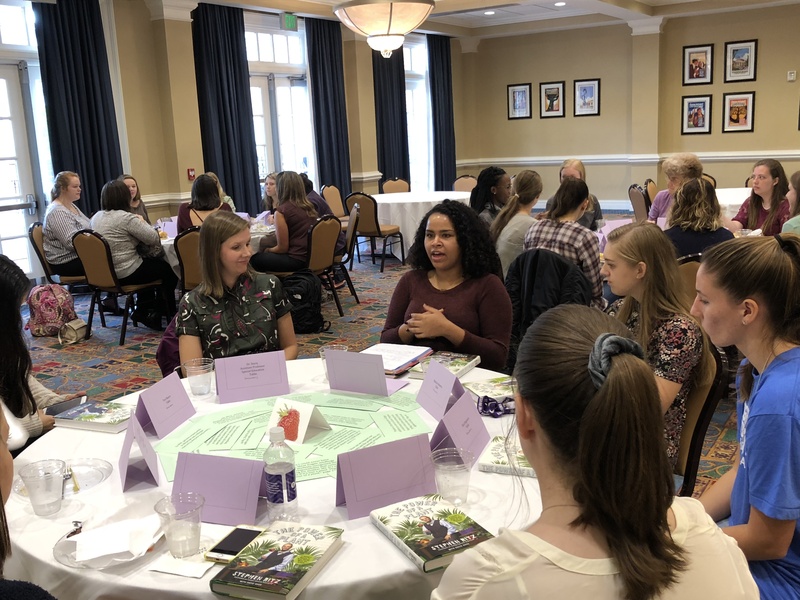 Opportunities for undergraduate research, professional development and mentorship from faculty and experts within the field are key components of the EDU-Fellows program. For fellows who choose to continue into the BA to M.Ed. 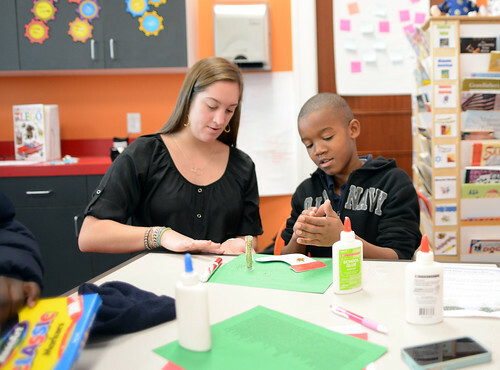 program, a residency option for completion of the student teaching experience is available through partnerships with local school districts. 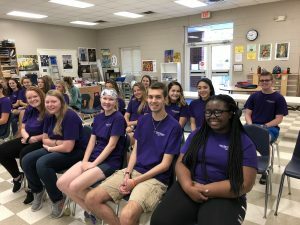 April 16, 2019 – As the 2018-2019 school year comes to a close, Education Fellows coordinator, Mrs. Rosie Tarara, planned and coordinated an End-of-Year celebration for the Education Fellows. Mrs. Tarara was surprised herself when Dr. Joe Blosser, Robert G. Culp Jr. Director of Service Learning, presented her with the HPU Service Learning Professor of the Year award for all she has done with her service learning classes. 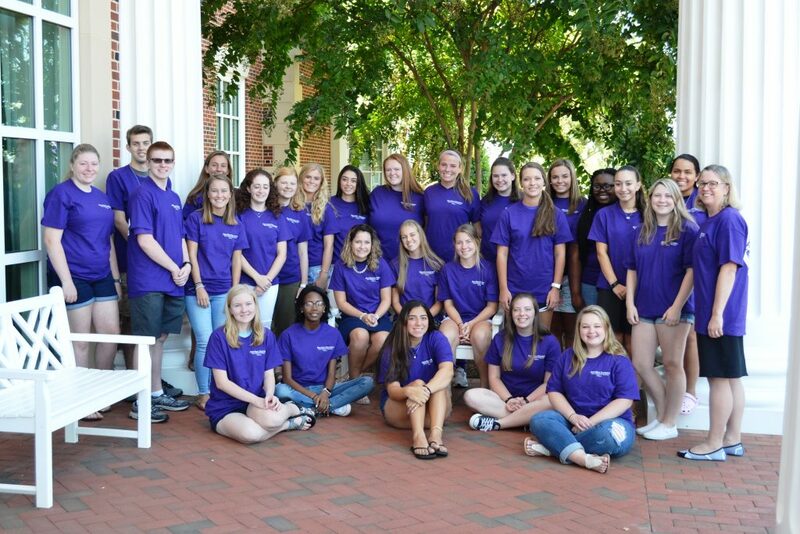 The group was then introduced to the keynote speaker of the event, Mr. Mark Jewell, president of North Carolina Association of Educators. Mr. Jewell shared with the Fellows his story of how and why he became an educator and what drove him to the great state of North Carolina. Highlighting the great investment the state government had in education when he came here, Jewell also addressed the problems of which plague the North Carolina education system. Jewell later revealed steps he and many other educators are planning to hopefully help better the education system in the state of North Carolina. 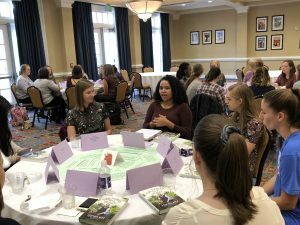 November 2, 2018 – The EDU Fellows alongside High Point University faculty discussed the book, The Power of a Plant, by Stephen Ritz. We were separated into groups of roughly five students, and two or three faculty for our discussions. On the table were scattered quotes from the book that we were able to use to feed into or begin conversation. We spoke in groups for roughly 45 minutes over lunch before we came back together, and had one person from each group share a summary of what their group discussed. October 9, 2018 – At the first Education Fellows Seminar, Dr. Shirley Disseler shared her expertise in creativity. 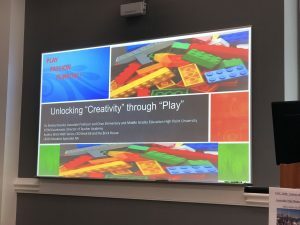 Dr. Disseler works closely with Lego to create curriculum for students spanning from kindergarten through eighth grade that fosters their creativity and “out of the box” thinking. During this seminar, the fellows learned about how many companies, such as Lego, Google, Amazon, Pixar, and Disney use creativity in their workplaces. 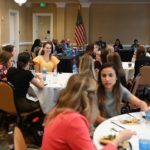 Knowing that over sixty percent of companies look for creativity first when hiring, even before integrity, helped explain to the fellows why it is so imperative that creativity remain in the classroom. By launching rocket flyers at Dr. Disseler (at her request), the education fellows were able to understand how important laughter is in relieving stress and improving performance and retention. After individually creating unique ducks from less than ten Lego bricks and finding that thousands of combinations were possible, Dr. Disseler made the point that all students learn differently and all teachers teach differently. 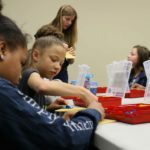 Students should not be expected to fit into a certain category when it comes to learning and should be able to receive an individualized education that encourages creativity. During a team cup stacking game, the education fellows were asked to each hold a string on one end that was tied to a rubber band on the other end. The goal was to manipulate the rubber band as a team to create a pyramid out of the ten cups. After establishing a winner of the first round, the teams were asked to repeat the activity silently. This activity revealed to the fellows the difference between someone leading and everyone having to agree in order to complete a task. Overall, this seminar was enlightening as to how a classroom can encourage learning and creativity together. 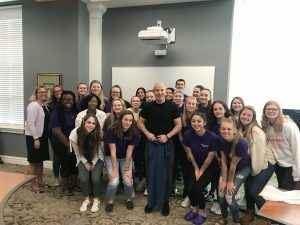 October 5, 2018 – The Education Fellows visited the Piedmont School which provides a unique education to children with learning disabilities who find it difficult to learn in an ordinary classroom. While there, there were able to observe how the school caters to different learning styles. Upon arrival they were able to see a perfect example of this. They were able to watch a teacher with his class playing a group game outside. The game was very simple and only required each child to throw a ball to their partner. The catch was that there were other teams doing the same thing at the same time. The whole point of the game was to work on their ability to focus. 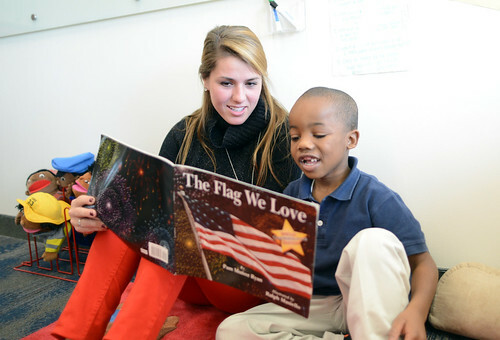 This is just one innovative way the Piedmont teachers provide their students with the proper tools to succeed. By the end of the tour, students were all able to take something away from this amazing place. The ingenuity of the teachers and their dedication to these amazing students is very inspiring! This school has left a lasting imprint and showed students that every child encountered has amazing potential! 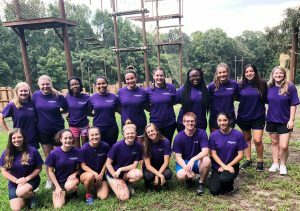 September 4, 2018 – The students from the Education Fellows Program traveled to the High Point University Estate to complete a ropes course. 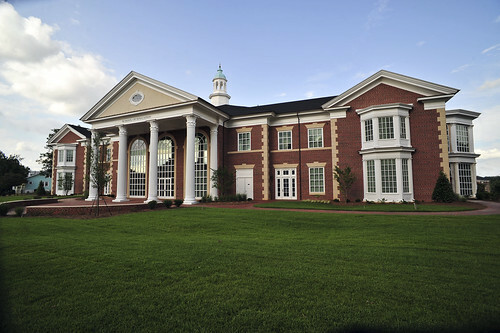 The ropes course is designed to provide activities that allow HPU students to collaborate and work together outside of the classroom. 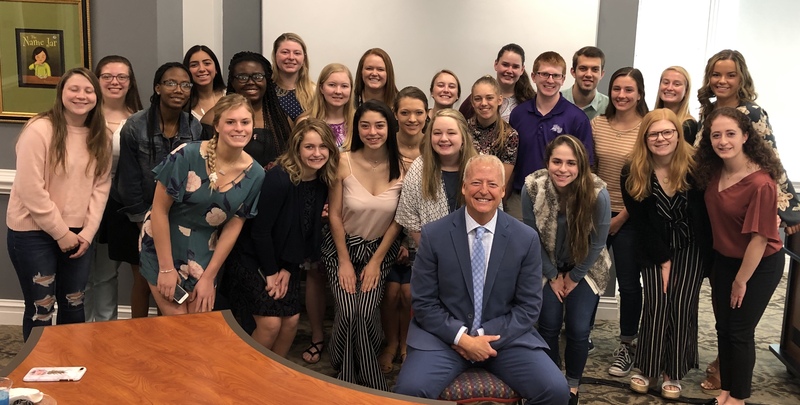 The students in the Fellows Program experienced many challenges, however, they persevered together to overcome these barriers and obtain success. The course enforced the use of team building, trust, confidence and leadership skills. The Education Fellows students embraced each challenge with an open heart, similarly to the way you would in a classroom. In a school classroom, a teacher must be open to any problem, whether it be physical, emotional or psychological. Trusting in oneself to overcome barriers is one thing, but by acquiring a connection with one’s peers, he or she can overcome anything with a little trust and teamwork. 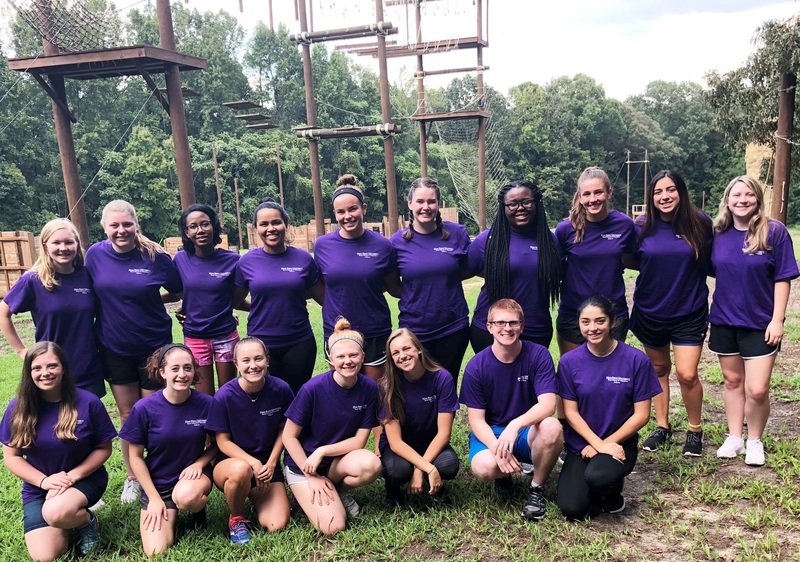 A ropes course may be more physically demanding than a classroom, however, by completing these challenging tasks, the Education Fellows bonded together outside of the typical school environment so that they may begin making a difference within the classrooms.